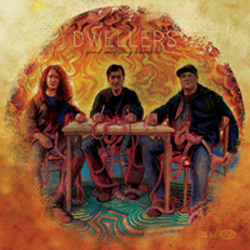 DWELLERS are a Salt Lake City based hard rock trio, comprised of Joey Toscano (guitar/ vocals), Dave Jones (bass), and Zach Hatsis (drums). Their most recent offering Good Morning Harakiri, was definitely one that impacted our auditory radar in a way that made us sit up and take notice. After their departure from doom metal 5 piece Subrosa, drummer Zach Hatsis and bassist Dave Jones joined former Iota vocalist/guitarist Joey Toscano to form the heavy, psychedelic and blues influenced hard rock outfit Dwellers. Dwellers' most recent release is 2012's Good Morning Harakiri (Small Stone), which is as raw as it is heavy: a unique blend of hard rock, stoner rock, and psychedelic elements with bluesy undertones brewing just beneath the surface. Although their genre could be considered "niche" in comparison to more mainstream heavy acts, their style is undeniably powerful. There are even points throughout the album that bring to mind a tinge of early Black Sabbath (for example, moments of their track "Black Bird" certainly recall Sabbath in their early days) which is high praise indeed. KNAC.COM had some questions for the band, and they were cool enough to oblige us. KNAC.COM: Let's begin with a little history lesson to bring our readers up to speed. How did you guys find each other, and how did Dwellers come to be? ZACH: Joey and I had other bands in the past that played a show in Salt Lake City together (Laughter for me, and Iota for him). We became acquaintances then. At some point I started to be "beat monkey" to help Joey and Oz (of Iota) write new songs, but as time went on Joey and I realized we needed to just start our own project- and from those ashes rose Dwellers. We decided it was time to get real and get a bass player after about a year and a half of playing together. Dave was already bugging us to jam so we tried out the mixture of the three of us, and it worked right off the bat. KNAC.COM: Here's a tough one for any artist or band: do your damnedest to describe your sound. ZACH: Gut Rock -- Guttural Rock and Roll. No brains, only riffs/beats/etc that come from your spinal chord are allowed in this band. KNAC.COM: Zach, you've drummed in several different bands, including Subrosa and Laughter. Did you switch up your play style at all for your work with Dwellers, particularly for Good Morning Harakiri? If so, what did you hope to bring to this album that was new or different from what you've done in the past? If not, what did you bring over from your previous work to help define your play style for this project? ZACH: Well, the only thing that is different about my playing in this band than previous ones is that I'm not thinking about what I'm playing. This project just needed simplicity... and even though I'm kind of going nuts on fills, I try at least to keep everything simplistic and not something that I have to *count* in my head or anything. Joey and I call it "Gut Rock". KNAC.COM: Same goes for you Dave. You previously played bass with Zach in Subrosa, so both of you knew coming into Dwellers that you were able to vibe off of one another in a way that worked well. Would you say you tried to take a different approach to your play style for Dwellers at all? DAVE: I didn't even think about, I simply played what I thought the music needed. KNAC.COM: Joey, your vocals and guitar playing are very strong on this record. As far as your guitar work goes, there's definitely a bluesy vibe present, which bodes well against the dark, heavy, and sometimes ambient soundscape. Were you consciously aiming to bring blues influences to the table when you set out to make this record? Or was it something that just happened organically as the songs took shape? JOEY: I'm not sure if I could wring the blues influence from my playing if I tried. It's just the way I have always played. Intertwined in my soul I think. One thing I did purposely set out to achieve with "Harakiri" is a darker, ambient approach to the blues. So I'm glad when people use those terms to describe the album. KNAC.COM: As far as songwriting is concerned, what is your "formula" as a band, if there is one? Is there a "primary" songwriter, or do you just jam together and the songs come as a result? JOEY: I do consider myself to write a big chunk of the material, but definitely not the primary creative force. Our basic formula is that I bring an outline of a song to rehearsal and show it to the guys. We play it together and if it clicks, we keep honing it. I think Zach's drumming style is the keystone to Dwellers' sound. He's incredibly talented, hits harder than most drummers I know, but also knows where to reign it in. That's what creates the drama and the contrast that I think this project has a special knack for. KNAC.COM: Let's talk about influences. As a band, which musicians/bands would you say have influenced Dwellers the most? Do you think those influences come across in the music? JOEY: We all like a lot of different music, and I doubt you'll find a lot of the same albums in either of our collections. Zach likes the Black Metal, exotic modes, and ambient electronic type of stuff. Dave digs the 70's rock; I think his favorite band is The Who. My tastes are a bit all over the map, but it's probably stronger in the older heavy rock stuff, old blues and psychedelia. Zach does this one Black Metal-type of drum fill, but then he'll effortlessly turn out Bonham triplet. So yeah, I guess you could say our influences are definitely found in the music. KNAC.COM: This question is for each of you individually- Which track, if there is one, are you most fond of on Good Morning Harakiri, and why? ZACH: Old Honey - Because I love Middle Eastern modes/scales/backbeats etc. JOEY: Ode to Inversion Layer - I think it has that dark, swampy vibe, and I like the title! DAVE: Lightning Ritual - I love the way it came out on the recording. KNAC.COM: We thought "Ode to Inversion Layer" was an interesting song title for sure. Natives of Salt Lake City will know what it means, but for the rest of us- where'd that title come from? JOEY: The song was written in the middle of winter, which for Salt Lakers means months of the "lake effect". We basically live in a giant soup bowl, with the valley being surrounded 360 degrees by mountains. So in the winter, the warm air entombs us in our own pollution. The sun could be out, and it could be a beautiful day outside, but for those living the Valley, they'd never know it. It gets so bad that we have our air quality days categorized much like Bush's "Terror Alerts": green, yellow, and red. When it's red, we are advised against even going outside. KNAC.COM: While we're on the subject of interesting titles, what's the significance for you behind the album title Good Morning Harakiri? We know that "harakiri" refers to ritual suicide through disembowelment, and on the cover art for your album, the three of you are depicted sitting around a dinner table with your respective innards spilling out. Can you explain why this title/imagery was relevant to you in terms of how it relates to the music? JOEY: I came up with the title as a metaphor for living your days as honestly as possible. When Zach and I started the band, our only rule was that we would create the music from our guts, and try to avoid writing for a specific genre, or a specific crowd of music enthusiasts. Music is so fractured into sub-genres now that it's exhausting to be a music fan, let alone a musician. It was freeing for us to avoid the trap of writing a song and then saying, "this doesn't sound like X style". We jokingly called ourselves Gut Rock. So, the artwork and title are the culmination those philosophies and concepts. KNAC.COM: Seems like a lot of bands are returning to releasing their records on vinyl- yours being one of them. We know that Small Stone has released Good Morning Harakiri on vinyl (in addition to the album already having been released via the standard avenues of CD, iTunes, Amazon, etc.) Was it important to you guys that vinyl was included as a release format for this record? JOEY: Vinyl was so important to us, that we wrote the album with the standard length of a single 12" in mind. For us, the vinyl version is when the album was truly released. I would do vinyl and digital file only if the call was mine. Screw CD's. KNAC.COM: You played SXSW this year. Tell us about your experience there. ZACH: Ruled. Totally the highlight of the tour. It was a total madhouse/zoo. KNAC.COM: Beyond Good Morning Harakiri, do you foresee another Dwellers record on the horizon? Can we expect further touring? ZACH: Yes and Yes. We have a new album that we are in the process of demoing the production of right now in our jam space so when it comes time to go out to Boston to record, we can get in and out and know how everything fits together as far as layers go, etc. KNAC.COM: Finally, where can new fans get their copy of Good Morning Harakiri? Where's the best place to keep up with your band online? KNAC.COM: Many thanks for taking the time to chat with us, guys. We'll definitely be looking and listening for further badassery from you in the future.